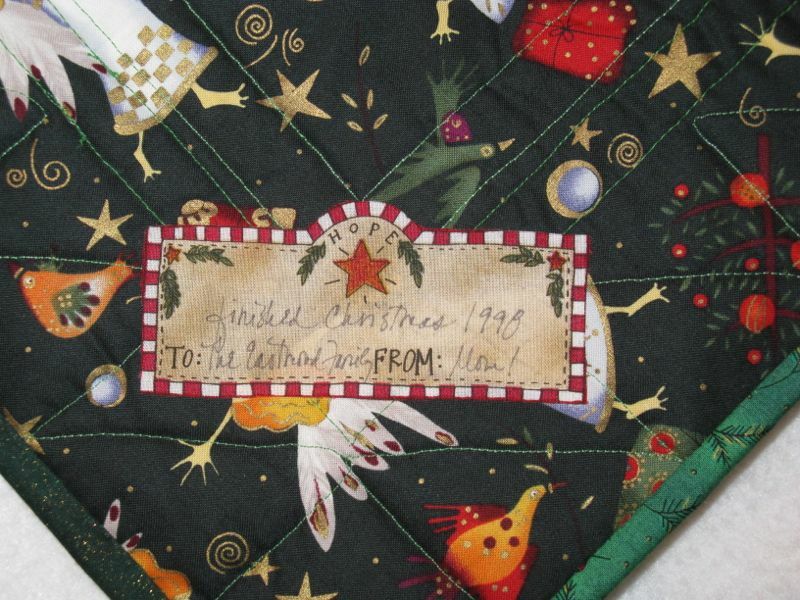 Posted on December 4, 2012 by Elizabeth E.
Today I’m guest-hosting over at Lee’s blog: Freshly Pieced, so I encourage you to head over there and see all the beautiful quilts in her Linky party, and leave some holiday comments to cheer all the quilters on. If you are arriving here from there, welcome! 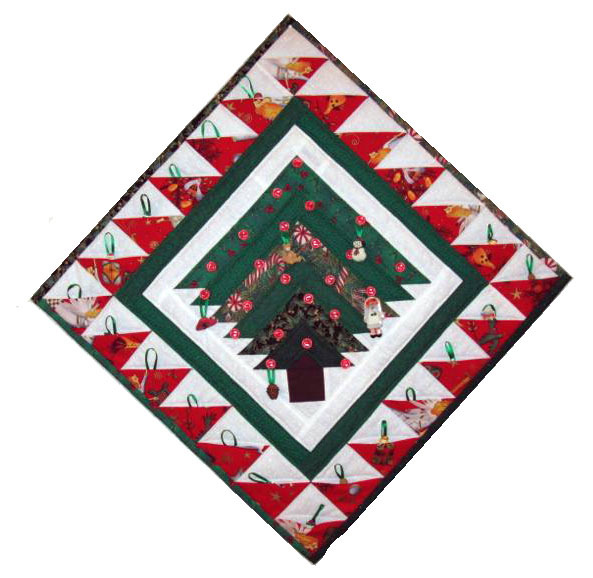 You may be here looking for the free downloadable quilt pattern for the Log Cabin Christmas Advent Calendar (above). 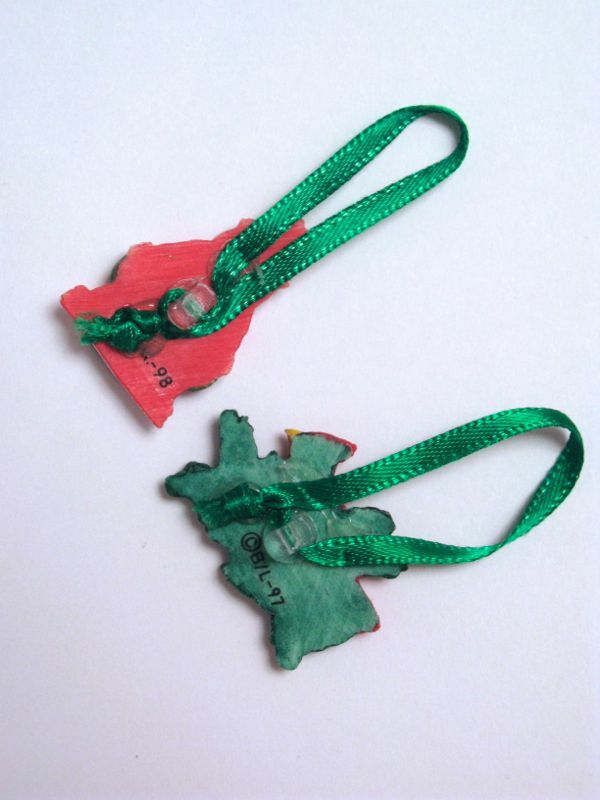 Here it is as a PDF file: Log Cabin Advent Calendar. You might want to download the picture above as a reference for things like buttons, etc. 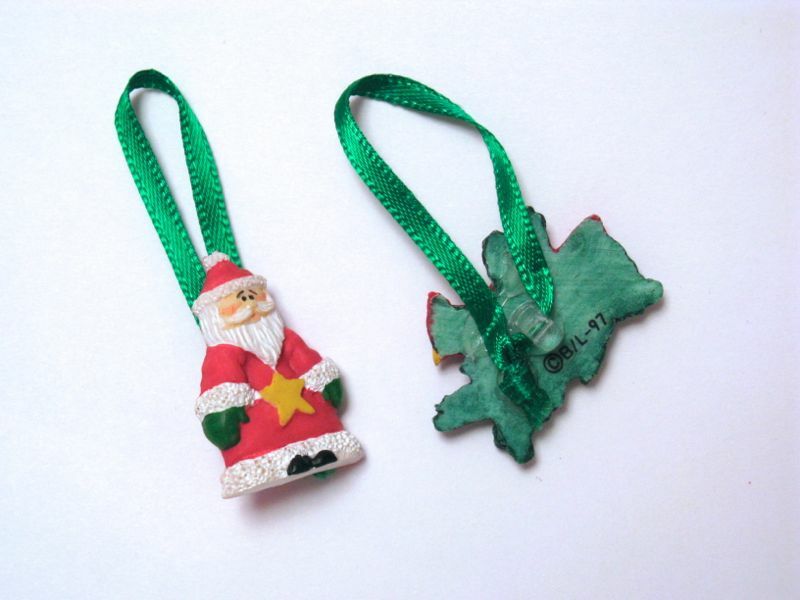 These two photos show how I tied the ribbon around my “ornament” buttons, then used a dot of hot glue to secure the knot in place. And I promised those in my readership a look at the finished quilt shams, mentioned in the last post. I bought that tiny little pillow at the after-Christmas clearance sales, shortly after Dave and I were married. It had been one of those harried, race-and-shop-’till-you-drop sort of Christmases, as we were shopping for all four children and each other and parents and relatives and friends. We’d had more than one of “those” finances, stress, did-we-need-this? sort of conversations, yet I wanted to provide a lovely (but not extravagant) Christmas for our newly joined family (Dave, a long-term bachelor, married me and my four children). Seeing the pillow in the clearance bin reminded me what I really wanted for Christmas, and it has gone on our bed every Christmas since then. We can’t forget the hurryhurryhurry feeling that always shows up this time of year, but I wrote about that over at Lee’s, so there’s no need to repeat myself here. Thanks again to Lee for inviting me to guest blog. And here’s to you–the quilters who make the Christmas quilts and banners and gifts and pajamas (that one’s for you, Lisa). I hope you have a lovely Christmas and holiday season. I think I like your Christmas quilt better than mine. I will have to blog it one of these days. I think I’ll have to get the kids to hold it so I can photo it. The shams look great. I love that you did them a year later. Gives me hope! 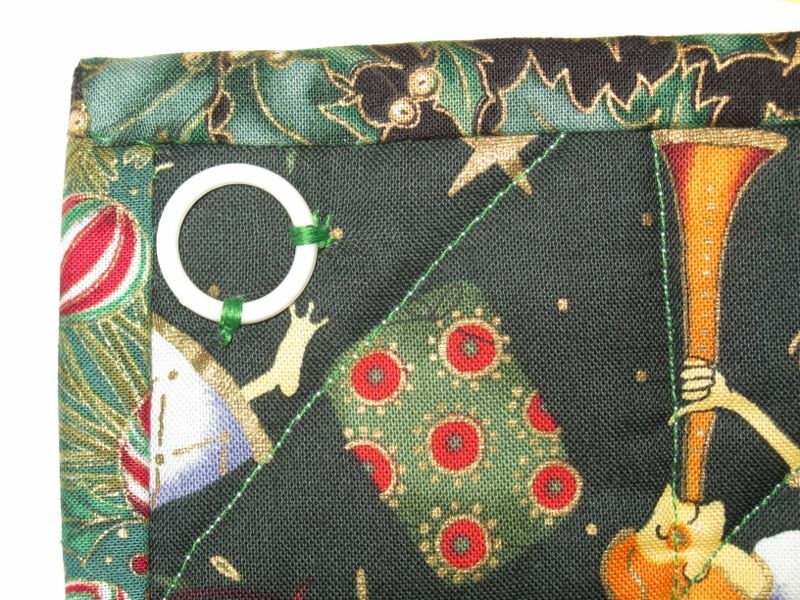 what a fun advent quilt – I just adore advent calendars. What a pretty bed, the shams and pillow are lovely. 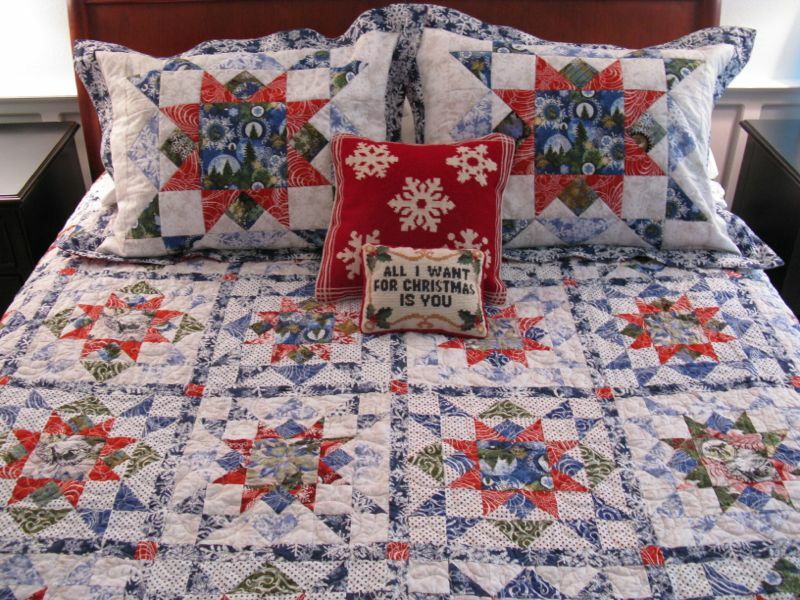 I love the blue in your Christmas quilt. I get tired of red and green. I love that idea for an advent calendar. I have been looking for one for a while to do and love how this comes together. My three year old would love to hang the different ornaments on each day. I think I’ll tuck this away for a pre-Christmas project for next year. Best wishes this season! Hi Elizabeth…thanks for your fantastic comment on the quilting. Please give the challenge months a try on your own…they are all posted on SewCalGal; and lots of fun..
Popped in to say hello from the mid century gang. Looking forward to looking around your blog some more. Hi. Do you have how much fabric is needed total for each pRt?